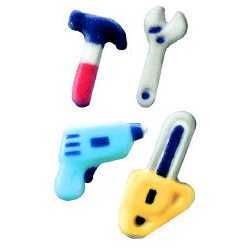 Wrench: ½" wide x 1¼" long x ¼" deep Edible sugar decorations. Dec-Ons® is a registered trademark of The Lucks Company. Edible sugar decorations. Dec-Ons® is a registered trademark of The Lucks Company. Ingredients: Sugar, Egg Whites, Modified Food Starch, Triethyl Citrate, Soy Protein, Guar Gum, Wheat and Barley Flour, FD and C Blue 1, Blue 2, Red 3, Red 40, Yellow 5, Yellow 6.